Yesterday I posted the first half of an involved trellis project. 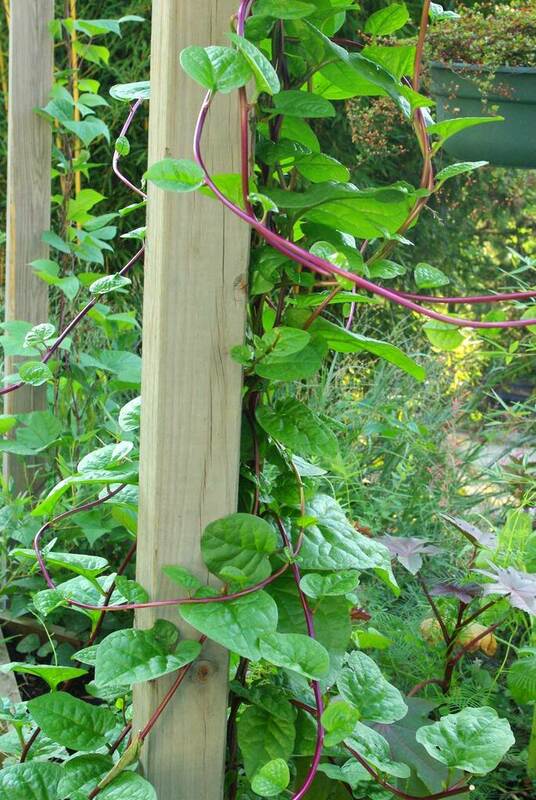 I love vines, so I'm always looking for spaces for them to grow in my garden. I've got a couple of pergolas that are becoming vine-covered finally (I got a late start planting the vine seedlings this year), I use the deck railing and supports as trellises, I have a couple of copper pipe trellises that I made, and even have a couple of simple tripod structures for vines to climb. 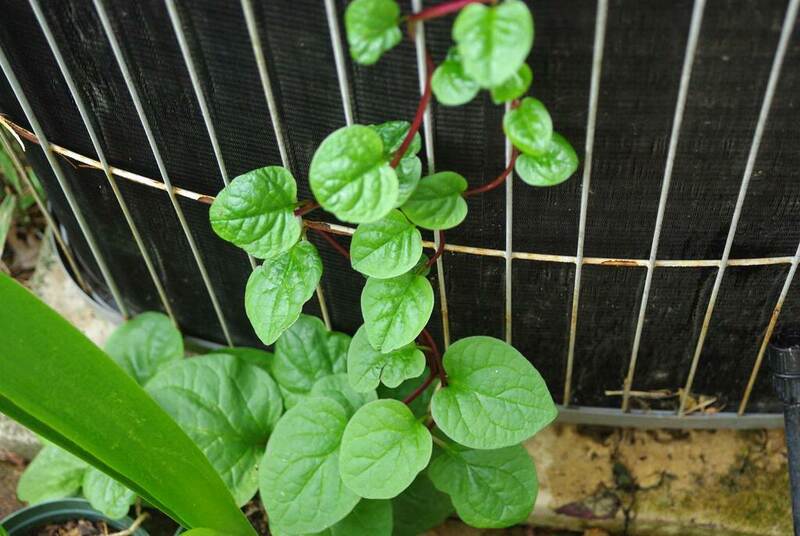 But now I'm going to add another to solve a little problem: this malabar spinach volunteer growing up my air conditioner. 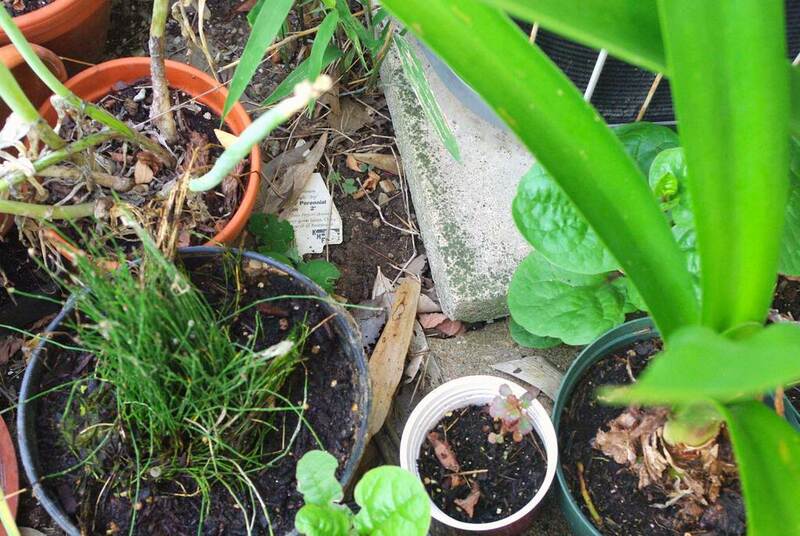 Flagstone pavers, tons of little pots (this is my plant "hospital" area), and not much space for any trellis. 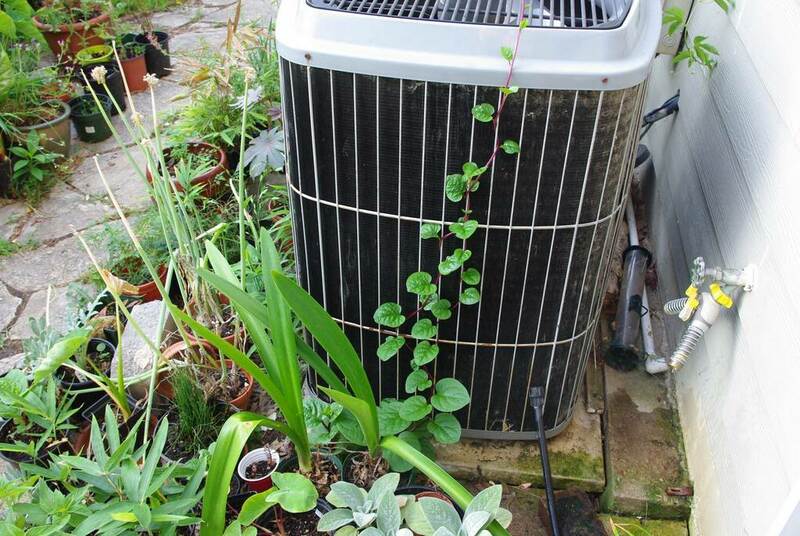 The vines are growing in the tiny crack between the air conditioner's concrete pad and the concrete driveway. I honestly can't see any soil but the clay soil under my driveway must be such nice stuff, because plants really love growing in the driveway cracks! 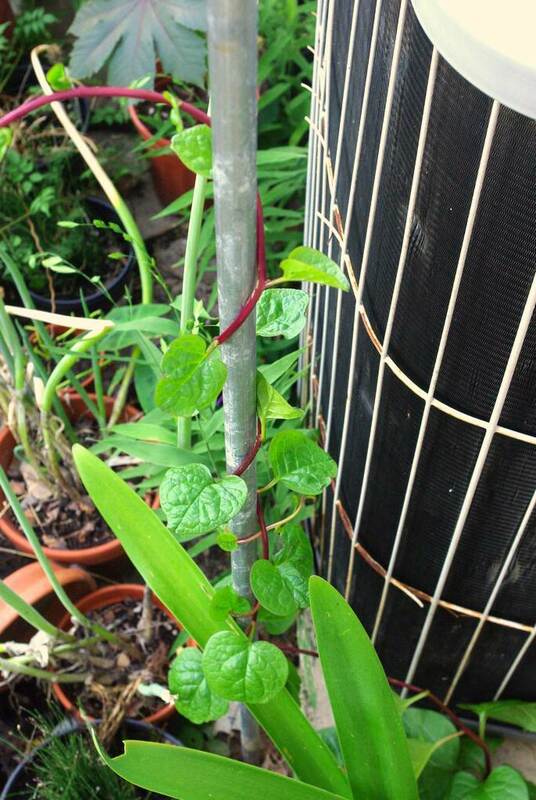 I love malabar spinach vines so much, and hate killing plants, so pulling these out was never an option. 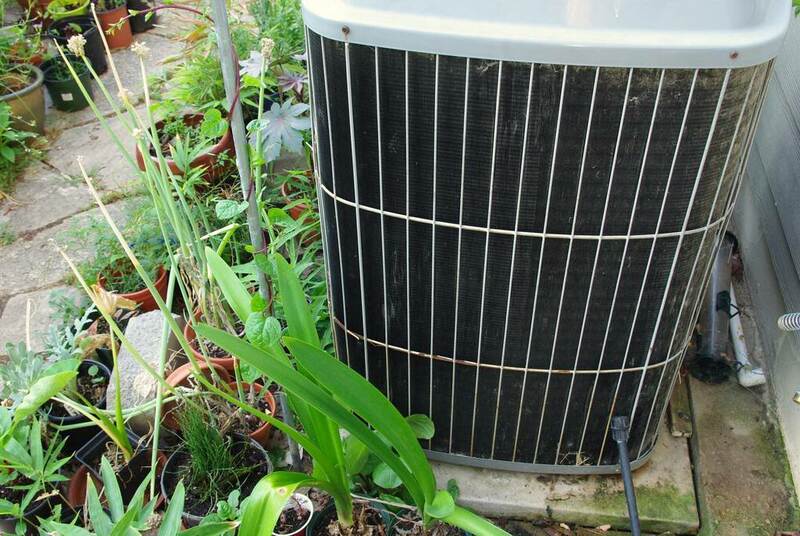 Letting them smother the AC unit is not an option either, as temps are supposed to be over 100ºF all week long and we need this machine working at peak efficiency! Perfect! I'll add my favorite type of trellis here: a single pole. 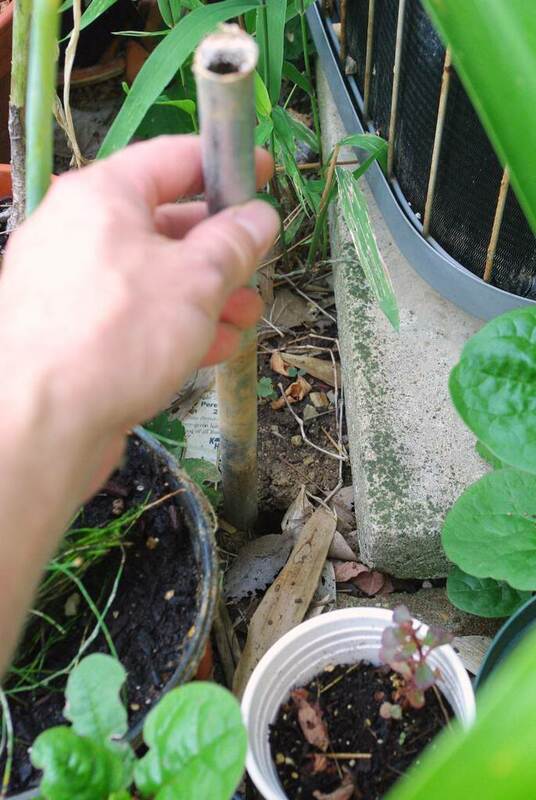 Once I hit softer soil I stopped pounding and put the 10' pole in -- again, just electrical conduit. I like electrical conduit because it's light, quite sturdy, and cheap: about $2 per pole. Plus I can easily cut it into shorter lengths if needed. 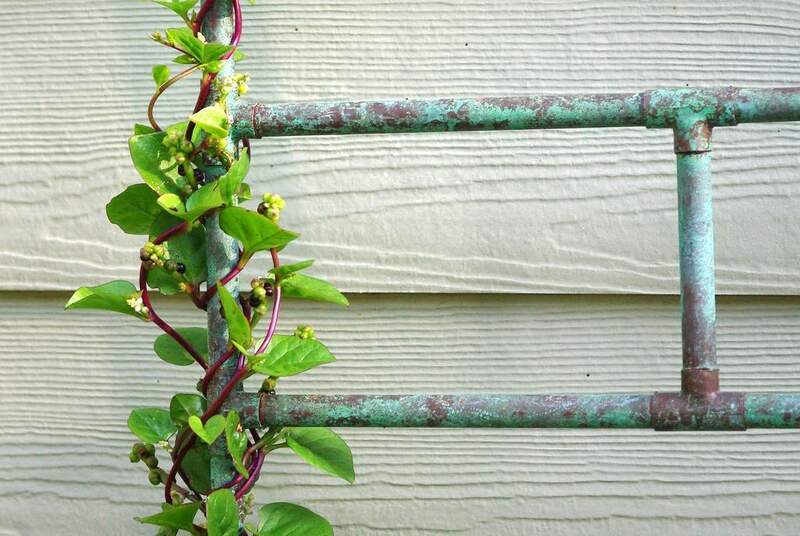 Some vines will have trouble climbing the slick metal, but malabar spinach has lots of grip -- it's got a rubbery surface, if that makes any sense. But I'll keep two of them going for a while in case something happens to one of them. I haven't seen evidence of rabbits eating these, but I'd rather have a crowded pole for a while than an empty one. What is especially nice about having this trellis here is there is another malabar spinach vine growing just a few feet away, so you'll be surrounded by this beautiful vine as you walk through here -- and I walk through here many times a day. I can't wait to see all of these in a month or so! One thing I didn't mention: it's important to get these poles as perfectly upright as possible. 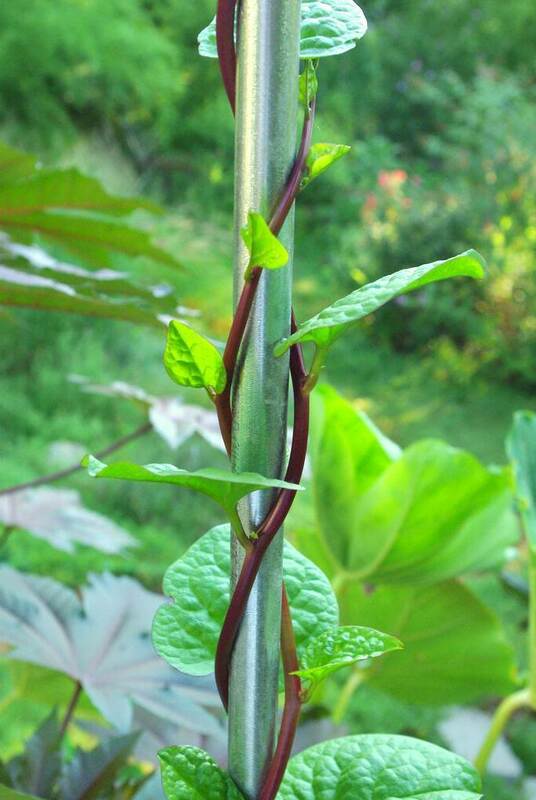 Any lean will result in a bent or toppled pole once the vine gets heavy enough. Fortunately it's quite easy to do this even without a level or other tools: just stick the end of the pole on the ground and balance it upright as best you can, then push it into the ground. In my experience this does the job! Wow, I'm surprised to managed to extricate the vine without damaging it. I've got to add some vines to our garden. I love the lush effect they produce. 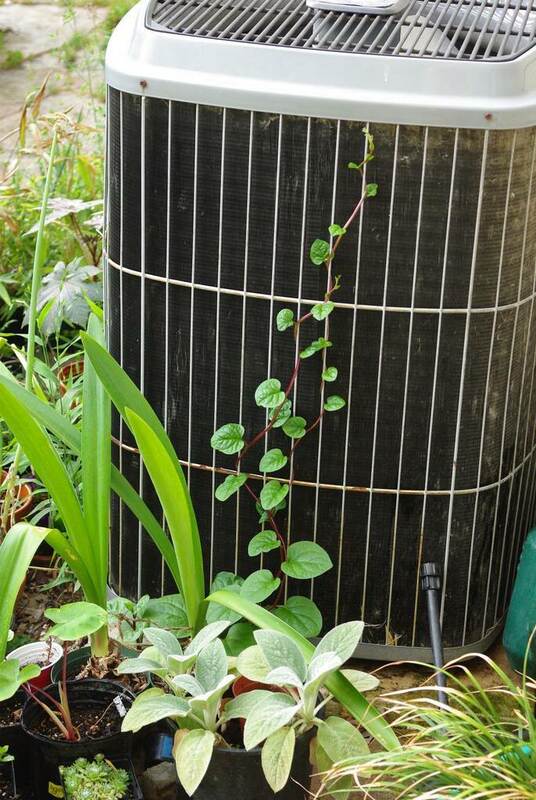 My concern is if the metal pipe will heat up the vine if the sun shines on it? Not only is it pretty, it's also delicious! Very creative and budget conscious project. The single pole is a first for me and look forward to seeing yours later in the season. Best. Poet Whale: If the poles heat up, it doesn't seem to have any effect on the plants. I'll keep an eye on it though. That purple stem is great. What a pretty vine. 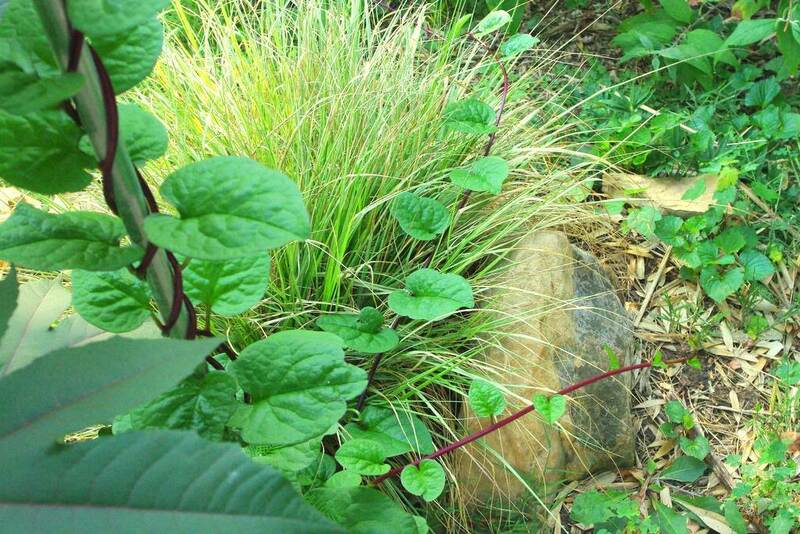 I've been meaning to try malabar spinach for years and now you have convinced me I really must. 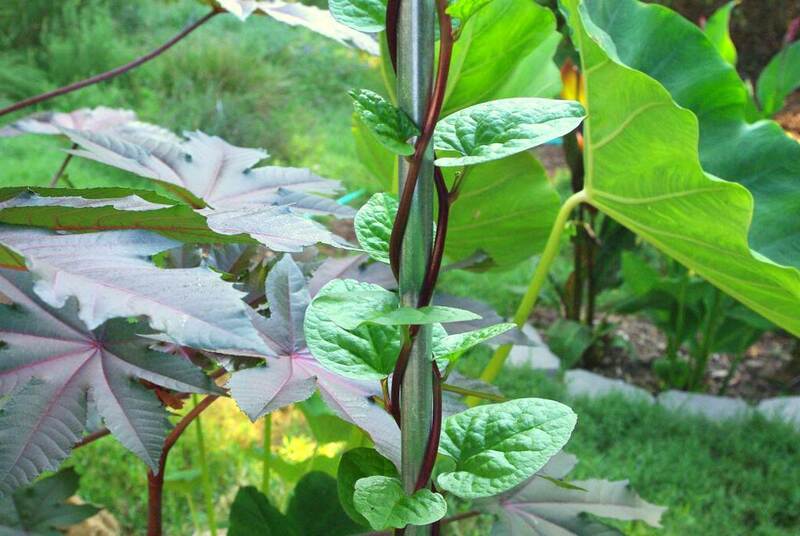 The red stems and green leaves make for a beautiful plant. Glad you got it away from the AC before it did damage. I need to grow some vines this year. You've inspired me.